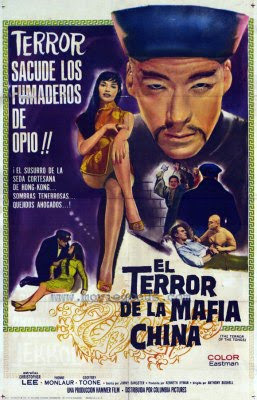 THE TERROR OF THE TONGS ( 1961) is my second and last film for Hammer studios. 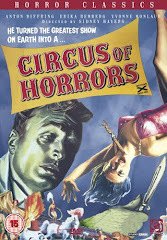 Internationally known for its horror movies, the British firm also produced, with equal skills, very different "genre" films (thrillers, comedies, science-fiction) for the major american studios. 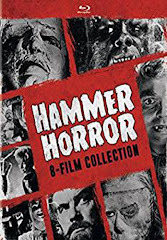 THE TERROR OF THE TONGS was considered an adventure picture, but its atmosphere and the horrific elements of the story, developed with care, gave the film the Hammer touch, so popular at the time. I also had the honor to appear with the other great Hammer star : Christopher Lee. 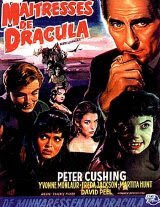 A year has gone by since the success of BRIDES OF DRACULA. I'm, once again, living in Italy where I go on with my career in very different kinds of films. I have just finished a comedy with Sophia Loren and Clark Gable (1). When Hammer gets in touch with my London agent, I am shooting GERARCHI SI MUORE under Giorgio Simonelli's direction. The Carreras wish to see me for their next adventure picture. It is no longer in the flamboyant style of the Gothic films, but a crime story taking place in a Hong-Kong harbour at the dawn of the 20th century. Knowing Hammer's inimitable style, I reason that whatever the subject matter, the film would have to be somewhat special. I wasn't wrong. 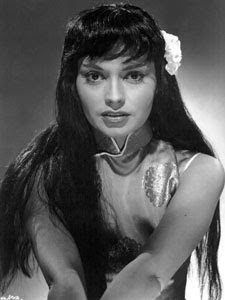 The synopsis mentioned that the female star was a eurasian girl. This intrigued me immensely. The production team was a little concerned with the way my character would appear. They wanted me to come for some make-up tests at the studio. I was soon back on the Windsor road that had taken me, a few months before, to the sets of BRIDES OF DRACULA at Bray studios. The make-up team (2) had been ordered to apply a light make-up, suggesting my asian origins without too much altering my looks. They decided on invisible adhesive stripes on the sides of my head, pulling the corners of my eyes to give them an asian appearance. The addition of a long black wig and pale skintone finally convinced the production team of the believability of my character. The following morning, after some preliminary costume tests, I went by some asian extras in a corridor, and they addressed me, thinking I was coming from their beautiful country. I, too, was finally convinced that the test was a success ! Hong-Kong, 1910. 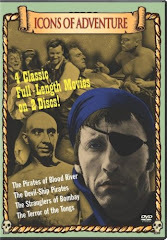 Captain Jackson ( Geoffrey Toon ) wants to avenge his daughter's murder, perpetrated by fiendish Chung King ( Christopher Lee) and his crime organization, the Red Dragon, which rules over the opium traffic and ransoms harbour activities. His henchmen are used to executing their opponents with little axes. Soon, Jackson manages to enlist the population, with the help of a clandestine ring of resistance. He frees Lee, a young slave (Yvonne Monlaur) who falls in love with him. During the final fight, which will lead to the victory of the resistance over the Red Dragon, Lee dies while trying to protect Jackson from a fatal axe. Defeated, Chung King commits suicide to escape from justice. The eurasian Lee was a marvelous composition, a really worthy character to play. By herself, she summarized the ambiguity that brilliant writer Jimmy Sangster liked to play with when faced with the stereotypes of the oriental mystery. She embodied temptation, unpredictability and wildness. Some clichés about colonial attitudes were also cleverly turned around when we discover in due time, in the story, that some Hong-Kong men hunting Jackson are in fact opponents of the Red Dragon themselves. Things are not always what they seem. As for me, I was alternating with surprising versatility between scenes where I was in turn lover or murderess ! That was as far as can be from Marianne Danielle's candour (3)! And that was fascinating to me. Great read, Yvonne ..Happy Christmas!